Left: Grapes on sticks, jelly in container & her daily vitamins, gummy bears. Right: Fried udon with chicken, HK fish cake, cucumber & carrots in tonkatsu sauce. L wanted more of the udon when she came home but I didn't cook that for lunch. Glad that she liked what I prepared today. I know I have mentioned many times how sweet my princess is. All those that are written here are true. I love to note down the little happenings of their lives. Last night, L went to stay over at her godparents' place. They invited her and she was so happy! Knowing that godparents have new games. Honestly, I was kind of disappointed that she was so enthusiastic about it. When she left, Z already fell asleep on the sofa. Good thing was that he fell asleep, otherwise both will 'fight' to go for sleepover. Today, till lunch time, I didn't receive any calls from her and I was quite sad. I was thinking she must be having so much fun that she forgot about us. Z and I made a video call to her and found out she was engrossed in playing games. When she came home after church, she happily came to me and gave me a present! A handphone holder! I was surprised! I gave her BIG hugs & kisses. She told me she 'bought' it with the points she had (the church gives out points every week to the kids). Me: Sweetie, why did you buy me a present? L: I miss you and I want you to know I care about you. Me: ......... (speechless & almost tearing) Thank you Sweetie. You are so thoughtful and sweet! We hug each other for a long time. Later, she told me she gave didi stickers that she got for giving the right answer for the quiz. She also told me she wanted to get a present for daddy but don't know what to get. 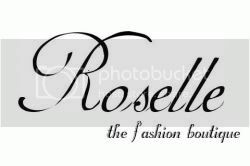 So she was thinking of us! I am very blessed to have such a wonderful daughter! I love you very much Sweetie! A video of Z singing Thomas song. This is his favourite past time right now, playing computer games and watching Thomas video clips from the website. Thank you all for your concern. I am very touched by the comments that you all left for Z and me and the smses and calls. When he is older to read the comments, I'm sure he would too. Z is feeling better! For the past few nights, we had to help him get on and off the bed, sofa and chair. Yesterday morning, I was surprised to see him get off the bed by himself. Me: You forgot today is Friday? It is weekday and jiejie is in school now. Z: Yes... *smile* Good morning mommy! For the past few days, besides watching TV and reading books with him, there wasn't much things for him to do. Like what I have said earlier, everything he did, he needed our help. AND now, he doesn't walk around slanting to one side! Before that, he was walking with his body slanting to the right and holding on to his right hand. I think he wasn't used to the additional weight of the cast. He played computer games since yesterday! He asked if he could play computer games and I told him that his right hand is injured, how to play? He happily replied,"mommy, I can use my left hand." Silly me, why didn't I think of it? Within minutes, he was very comfortable playing computer games with his left hand. I was so happy looking at him moving the mouse! When he watches TV, he doesn't need my help to sit down on the sofa or get off the sofa. He needed help only if he was sitting on the floor. During lunch time, he fed himself. It was messy but I was so happy that I didn't bother about the mess. Showering for him was tough. We have to ensure that his hand doesn't get wet and the past few times when we washed his hair, he screamed and cried! He wanted to play toys but most of it need both his hands. Yesterday while jiejie was having her ballet lesson, we went to the mall for a walk and at the same time bought some extra BIG t-shirt for him. He can't wear all his clothes now so I have to buy new ones. He tried playing with the game console which was on display but as you know, he has only one hand that he can use now. He was disappointed that he can't. I decided to buy something as a reward for being such a brave boy. It was none other than Thomas & his friends engine, Duncan. That cheered him up and this morning he started playing with it. Of coz I didn't forget about my princess. I bought her something which is her favourite right now, Hannah Montana. I have made a call to his piano school and sent them the MC to stop his lesson for the time being. When he recovers, we will have to rebook the timing and hopefully he can get the same teacher. When I told him about it, he was quite disappointed... He said he can use his left hand to play but you can't just practice on your left hand right? I explained to him and he seemed ok with it. I also made calls to the school and his young reader center. The teacher from school called me back yesterday to find out what happened to Z and she said she has packed his worksheets for him. But I thought I have asked my friend to tell her that Z fractured his hand and he can't write at all. She explained that though he can't write, at least go through with him what the classmates are doing. The teacher from the enrichment center advised me to stop his lessons for the time being and let him go through his old reading books. For Chinese enrichment, the teacher told me to continue with his lesson and she will be extra careful with Z. That I'm not so sure, we'll wait till after her checkup then I will decide. As for swimming, I planned to tell the coach the following lesson. 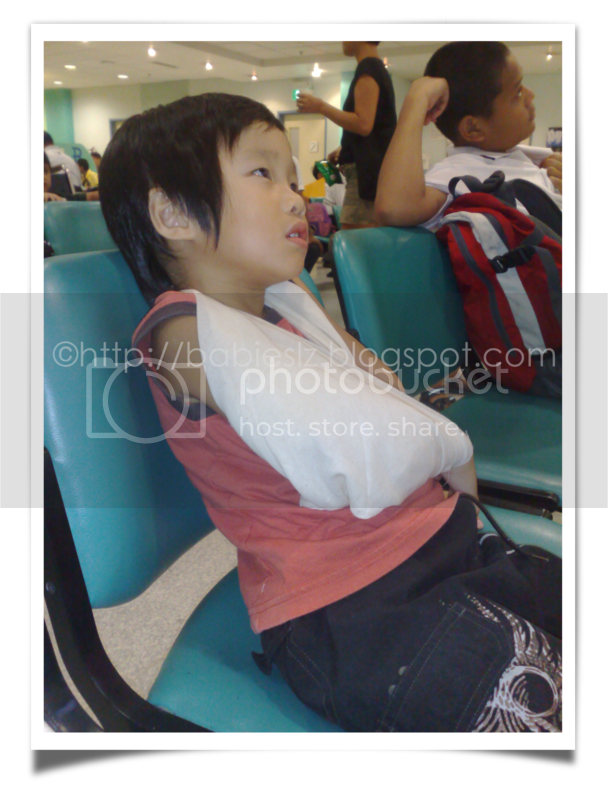 He is exempted from PE lesson for at least 3 months. Seems like it will be a long time before things are back to normal for Z... That day I asked him if he would like to the playground again and he said no. I think he has the phobia now whenever he sees the playground. Parents out there, do keep an eye on your child when they are at the playground. I hope none of you have to go through what we have gone through..
Got to go now. We have visitors coming to our house later and we better pack up! 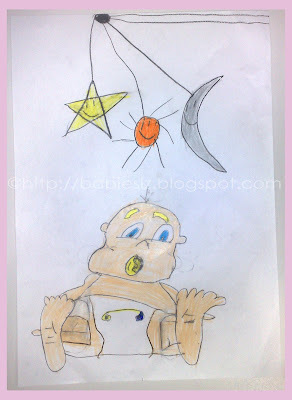 I have been busy taking of Z that I forgot to blog about his progress report. Better do it now before I forget. Generally, Z is doing well in school, except that he needs to improve on his Chinese. He needs help when given a pic and he was supposed to describe what he saw he in the pic. For English, I was surprised that his reading skills was only average. He is good in identifies sounds in consonants, ability to blend letters and show interest in book. But when comes to ability to read a book, shows interest in reading and ability to blend letters, he got an average. Hmmmm.... From what I know from his young reader enrichment class, he is more advance than his peers and I have seen it myself. Anyway I am pretty happy with his progress in school. Z is friendly towards teachers and peers. He has adapted well in his learning environment and is improving consistently with guidance and encouragement. Keep it up! He will not be going to school for quite some time. I hope he will not miss out too much, otherwise he may feel left out when he goes back to school. Baby, mommy is very proud of what you have achieved so far. Well done my boy! I think I have neglected L for the past few days and I feel very bad... I talked to my princess and she is sooo understanding. Sometimes I wonder if she is really the little worm in my stomach... Hehehe... She knows what I think at times. I apologised to her for not spending time with her the past few days. Z has taken up most of my time till today, he was much better. She told me that she understands that at this time, didi needs us more. She helps me takes care of Z too. Last night, they were supposed to be in the room sleeping, but Z came out for a while and she followed. They both wanted to give us goodnight kisses again. When they went back to their room, L turned on the lights and LZdaddy wondered why, so he asked. She replied that she was helping her brother to his bed and she turned on the light so he can see better. So sweet right? Then LZdaddy saw her gently holding on to Z and helped him settled in. 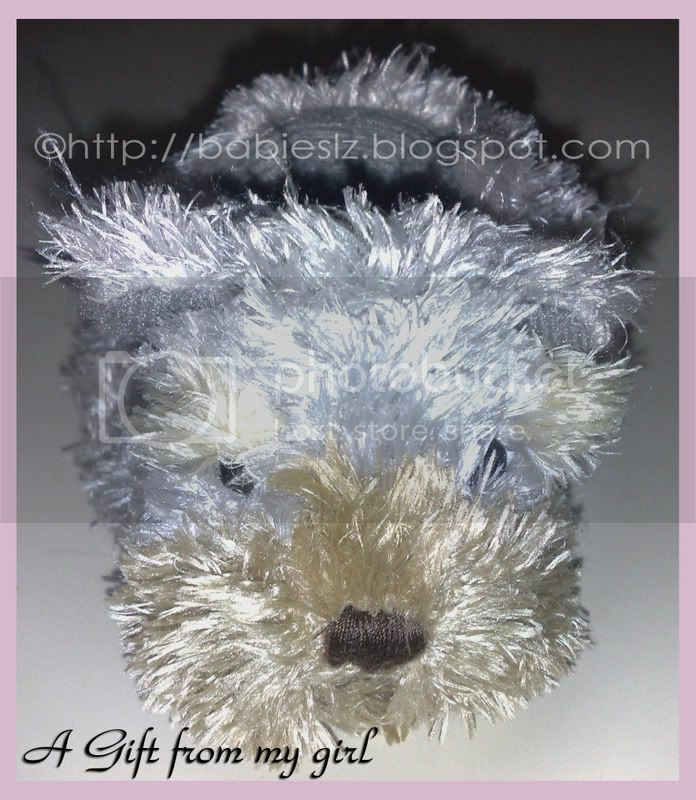 She also helps whenever didi needs something, remote control for TV, drinks or toys. She definitely has lightened my load. I was glad yesterday that I sent her to her enrichment class and we managed to have girl's talk, though not long. It was great to have some time alone with my princess. Yes, she maybe naughty at times, but these sweet little things that she did for us has make me love her even more and less angry with her. Honestly, isn't it normal for kids to be naughty at times? Top tier: half star shaped egg and chicken drumlet. 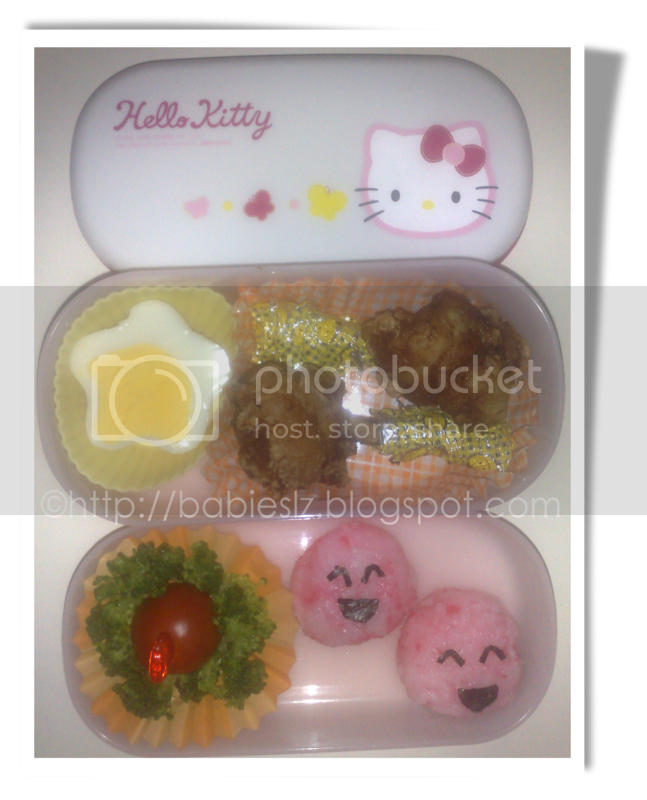 Bottom tier: broccoli, cherry tomato & face shaped rice. 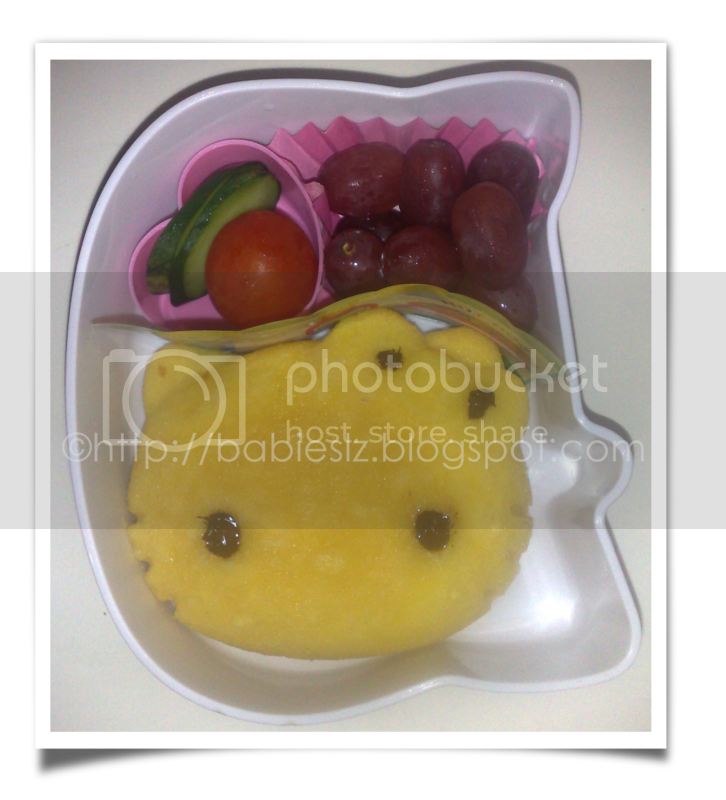 After saying bye bye to my girl at the door, I realised I forgot to pack any fruit in the box! If I ask daddy to turn back, he will probably nag at me. I am really very forgetful these days... Haiz... When she comes home later, she will have more fruits then or she may buy fruit at the school canteen. This a very very long post. I try not to miss out any details as Z will read it when he is older. I was interrupted many times while writing this & the previous post cos my Prince Z constantly needs my attention. 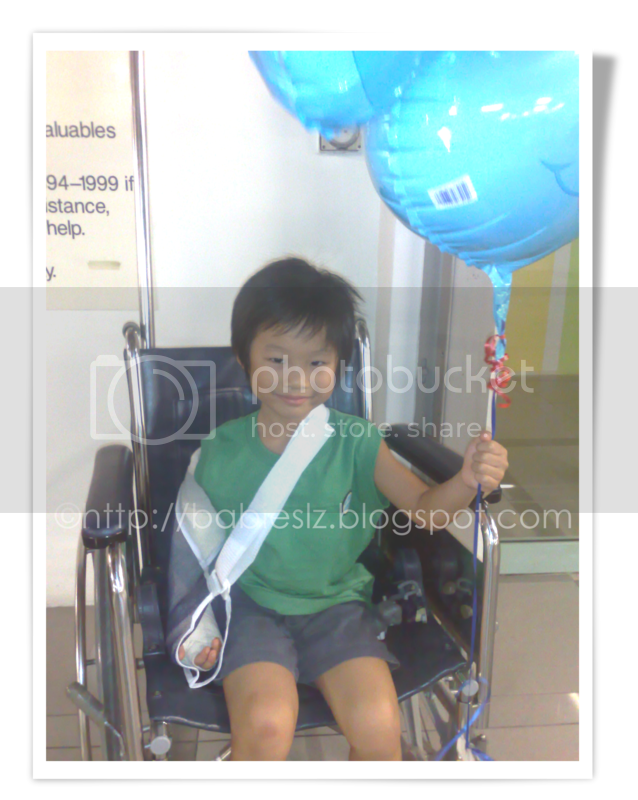 When we arrived at the ward (23rd Jun), Z was rather happy. He asked me again if I was staying with him, of coz I was! Then he said could I get his stuffs for him, like Goofy & his Dino cards. Forgot to mention in the previous post that he was given pain killer at the A&E, that's why he cheered up and didn't seem to feel the pain. Just as he was about to get ready sleep, one of his doctors came in and talk to me about his condition. He told me that Z definitely need surgery to help him recover and that they will try to arrange him to have it done at 0100hr but he had to further discuss it with the other doctors. Honestly, I couldn't concentrate on what he was telling me.... All I know was that my boy needed surgery. Shortly after that, another doctor came in and talked to Z... It was nice of him to talk to Z about Thomas the engine, which is one of his favourites. They excitedly talk about it and the Doctor said if Z behaves himself tomorrow, he will get lots of Thomas & friends stickers from him and also promised him that he will get to play bubbles too. I didn't tell Z what will happen the next day... I don't know what to tell him and if I tell him the details, I think he will freak out. I only told him that the doctors will try their best to make him feel better and help him recover fast. Then just when he was about to fall asleep, the first doctor came back with another doctor. He seemed more experience than the first one, let's call him Doc A. He told me what will happen tomorrow and why was it necessary for him to have this operation. He told me that Z had a Rt Supracondylar fracture type 3, they were to do a closed reduction and percutaneous pinning. Articles on this can found HERE & HERE. There are risks in this surgery as there are nerves around it. They planned to insert 3 pins to it. If this procedure fails, they will have to make a small cut and insert metal plate instead. It was scary to hear what he said. 15 mins after he fell asleep, the nurse came in and told me the surgery were scheduled at 0700hr. She advised me to wake him up to have something to eat as he will not be able to eat anything till noon time. Poor boy.... I woke him up and we went downstairs to grab something to eat. He ate chips, sandwich and a bottle of milk! Boy, he was hungry! He fell asleep 10 mins later... While he was sleeping, I went home to take a quick shower, packed his stuffs and get jiejie's things ready for the next day. (24th Jun)I couldn't sleep when I was there, pacing around his bed and it was cold. It was sweet of the nurse to get me a blanket. At about 6am, the nurse told me the OT(operation theatre) just called and it was time for Z to wake up. My poor boy..... He was very tired... The nurse wanted to get him a wheelchair but he refused to use it. He kept asking if I will there with him and I found out from the nurse I can keep him company till the surgery starts. About 0700hr, we were directed to the OT room 12. It was scary.... I can't imagine what my poor boy will be going through in there. There were 3 doctors and 3 nurses with us and I found out much later that his main doctor (a senior orthopedic surgeon) was there. That means he had 4 doctors attending to him! First, the doctor gave him the stickers as promised. Then I was asked to carry him on my lap and sat on the chair. One of the nurses started playing bubbles with Z and I was asked to hold him tight. One of the doctors blocked our view and hold on to his arm and the other trying to find the vein to proceed GA (general anesthesia) on him. He struggled during this time and the doctor asked him to start counting backward. Before he could do it, he knocked out and they took him from me and placed him on the table... I cried... I couldn't help it. I wished I could be there with him throughout. It was an ordeal waiting for the outcome outside the OT. An hour later, the senior surgeon came to tell me that the surgery was a success and another doctor will soon come out to inform me with more details. 10mins later, doctor A came and we went in to the OT again. This time, the doctor showed me the x-ray again. When I asked him how bad was the crack, he told me it cracked through and through! I didn't know it was that bad! I cried again... He said they have inserted 3 pins into it, 2 from one side and the other, 1 pin. The surgery was a success and they do not need to do the other method. What we have to do is to make sure there's no complication and infection after that. He also said soon the nurse will pushed Z to the recovery room and were trying to wake him up. Meantime, I will have to wait for the nurse to call for me just in case when he wakes up and ask for me. I decided to postpone L's lesson to Saturday so she can visit her brother. She was happy and I was glad that I did that. L: Mommy, are we going to see didi now? L : Can I hug him? Me: I think it will be difficult for you to hug him now. He just had an operation. L : Then can I kiss him? While daddy settling the bill, he dozed off. Does he really looks like a girl? All the nurses call him 'she'. Knowing that my kids like Macdonald, I bought it for their meals. LZ had their meals together and this time, I fed him slowly. I was glad that he did not vomit this time round. During this time, another of my cousin came. Later, we were told by the staff that we have a choice to check out this evening or the next day. LZdaddy preferred him to stay another day but I insisted that he should go home. I thought this means that he was ok and he would be more comfortable at home. Well, I was wrong. Everything he does, he needs our help, going to toilet, sitting on the sofa etc. He was also frustrated too. I understand... There so much things that he can't do at this moment. He didn't sleep well throughout the night and that include all of us. I was also worried for L as she didn't get enough sleep. Let's hope things will be better as time goes. The doctor told me that I should observe Z that he doesn't come down with fever during weekend. This is a crucial time. If he has fever, we should immediately bring him back to the hospital. It also means that he has an infection. On Monday evening, my friend and I arranged a play date for our kids. They have not seen each other for quite some time and I have something that I wanted her to pass it to our friend in Amsterdam. Things was fine, the kids played bubbles and at the playground. Safia and I kept a lookout for our kids at times. Then suddenly I heard Z crying very loudly.... I saw him sitting on the floor and his sister nor his friends were with him and I rushed to him. 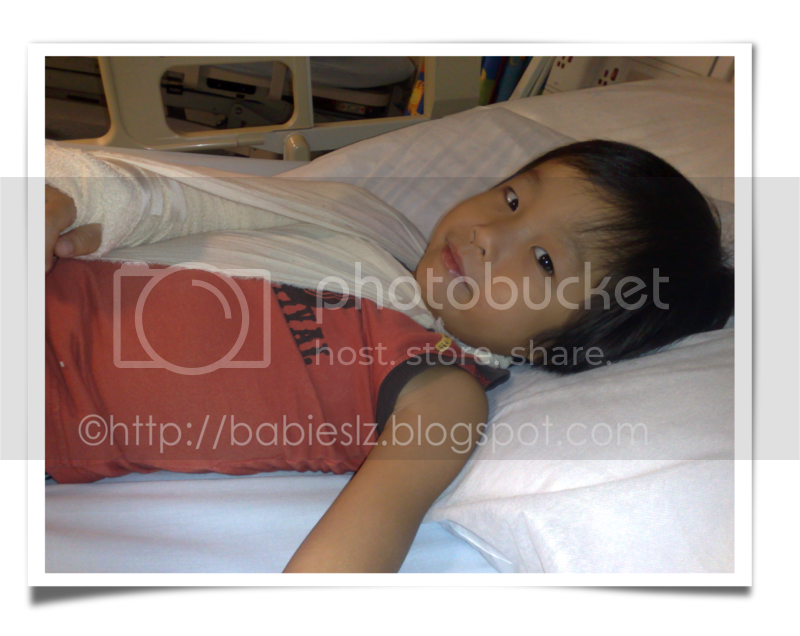 He told me he fell from the platform where the monkey bar was and his right arm very painful. We sat on the bench and convinced him to let aunty Safia have a look at his arm (he didn't allow any of us to touch it). Aunt Safia (used to be a nurse) couldn't find anything wrong with it but I was sure he has fractured his elbow AGAIN! Slowly, I saw that his elbow started to swell. We went home and I rushed to give LZ dinner as I knew when we go to the hospital, we will spend a long time there. At that time, Z couldn't move his right hand at all and I had to feed him. When we rushed out of the house, I realised I have not taken dinner myself! If you have been to KK, you would know that first, they have the nurses to assess the condition and THEY COLLECT CONSULTATION FEE too before you get to see Doc. Z was immediately sent to the 'red' door where he got to see the doctor first and have a x-ray done. Doc confirmed my greatest fear, he fractured his arm again AND it was not the previous time (which was a hairline fracture). This time, there was a crack on the bone and he has to be admitted to the hospital immediately and probably need an operation. 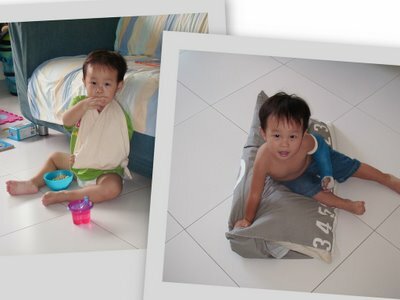 It was Oct 2005 when he fractured his left arm... He was not even 2 yr old! I wrote about it HERE. While waiting to see the doctor again after the x-ray. By this time, I couldn't help but cried.... Z too... I knew I shouldn't but My heart ache when I heard. And it got worst when they have to change his bandage. He cried madly when they tried to straighten his hand and he grab hold of my hand. I felt so helpless.... All this time, jiejie was with us. She looked scared and worried... While we were waiting for Z's turn to take x-ray, she was so sweet to take care of Z and helped him. At times, Z threw temper at L and she just kept quiet. Sweetie, thank you for being so understanding. Just a quick note before I rush back to hospital. Z will be going for surgery at o7oohr. He fractured his elbow and Doc need to insert pins into it. It is not a major surgery nor a minor surgery. But for a 4 year old boy, it is a major one. Will update when I have time. I baked the sponge cake last night, HK shaped & Pooh shaped. This was my 2nd attempt to bake the sponge cake. The first time, I forgot to spray oil on the mould and some part of the cake stuck to the side. This time, I remembered but I think I spray too much oil. It looks oily.... Nevertheless, my family like it. While I was baking this morning, both were busy drawing. I was surprised with these drawing! L drew a baby. I was very impressed with it and I actually questioned her if she trace it from the book. Sorry Sweetie, mommy shouldn't do that. She followed the instructions and it turned out so well! 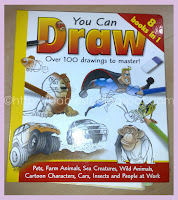 This is the book that daddy bought for them quite some time ago, knowing that our babies love to draw. 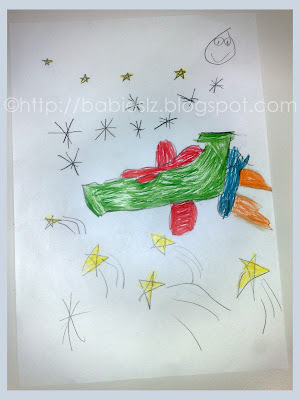 Z drew this and he called this a 'super car' and he also called this a rocket which will fly to the outer space. Wedding Lunch & Mervin Who?